First off, let's all congratulate Ok Go on their Grammy win for Best Short Form Music Video! I think they should also win Best Dressed. I love bands, or people in general, who care about the way they look or present themselves. Call me shallow, or what you will, but I don't care, blame my career. Anyways, I did this a while ago, but I didn't upload it right away, because I thought I had too many Ok Go theme posts. 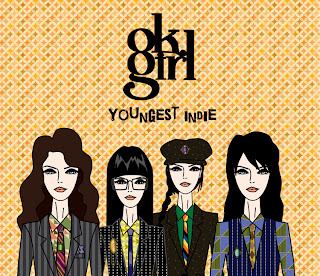 I thought, if Ok Go had an all-female tribute band, they should be called "Ok Girl". Anyone wanna join me? Last summer, I was out shopping with the design department for market research. We hit up all the important stores in LA. We stopped by Paul Smith, and when I had gone in, I saw a guy who looked like Damian. I thought to myself, wow, there's a sales guy here who looks just like Damian. Then after looking at the womenswear, I went to the menswear section, and saw Tim. Then, like such an uncool, I told my boss, omg, that's my favorite band over there!